Coal and nuclear plants would receive a lifeline under the DOE's new proposed order. In an unprecedented move, Trump administration officials are preparing to order U.S. grid operators to purchase electricity from struggling coal and nuclear plants, in an effort to prevent them from shuttering. “Federal action is necessary to stop the further premature retirements of fuel-secure generation capacity,” states a 41-page draft memo first obtained by Bloomberg. The memo, also obtained by GTM, is dated May 29, and was circulated ahead of a National Security Council meeting to address the issue on Friday. UPDATE: President Trump ordered Energy Secretary Rick Perry to stem coal and nuclear power plant retirements in White House statement issued Friday afternoon. The Energy Department also plans to direct power plants on the SGF list outside of RTO/ISO territories to continue operating under their existing contractual arrangements with load-serving entities. The DOE is also planning to establish a “Strategic Electric Generation Reserve,” in the name of promoting national defense and maximizing domestic energy supplies. The Order is described as a “stop-gas measure” that would remain in place for 24 months as the DOE completes a more in-depth analysis — never before undertaken — to designate “Critical Defense Facilities served by the Defense Critical Electric Infrastructure.” This analysis includes research on specific vulnerabilities in the U.S. energy delivery systems, including interdependencies between electric generation and transmission, natural gas and petroleum pipelines, and supply chains. The memo confirms earlier reports that the Energy Department has been looking to use its emergency authority to shore up coal and nuclear power plants – which are struggling to compete against low-cost natural gas and renewables. The leaked memo adds a new justification for federal intervention, citing the risk of cyberattacks causing disruptions to gas and petroleum pipelines. "This exposure is minimized where electric generation facilities are able to maintain fuel stockpiles on site, as with coal and nuclear." This isn’t the Trump administration’s first attempt to save the two ailing industries. Last September, Energy Secretary Rick Perry introduced a plan to provide support for power plants with 90 days of fuel on site – something only nuclear and coal plants can do — citing a critical need for enhanced grid resilience and reliability. However, the plan was rejected by the Federal Energy Regulatory Commission, which opted to open its own resilience proceeding instead. 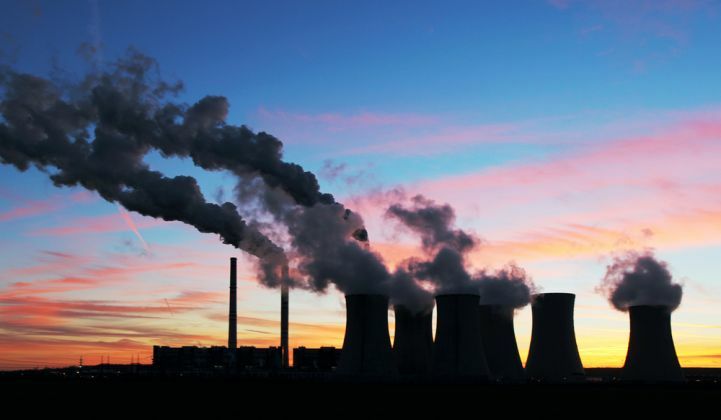 Then in March, FirstEnergy requested the DOE use its emergency authority under Section 202(c) of the Federal Power Act to provide a lifeline to its coal and nuclear plants. The White House denied a similar request from coal mining company Murray Energy last year. The Trump administration has not confirmed a final strategy. However, the recently obtained draft memo represents the administration’s most fully developed plan to intervene on behalf of coal and nuclear power plants to date, which is now being presented to top security advisers at the NSC. Reactions to the memo were swift, strong, and almost universally negative. Grid operator PJM Interconnection tweeted out a statement Friday afternoon that it had not received any official documents from the DOE, and that there is no need take drastic action to support the grid. "Our analysis of the recently announced planned deactivations of certain nuclear plants has determined that there is no immediate threat to system reliability," the operator stated. "Markets have helped to establish a reliable grid with historically low prices. Any federal intervention in the market to order customers to buy electricity from specific power plants would be damaging to the markets and therefore costly to consumers." The same unusual coalition of renewable energy, natural gas and big energy customer trade groups that came together to oppose DOE’s push to give coal and nuclear plants out-of-market payments, also filed its opposition to using emergency wartime powers to accomplish the same task. “To invoke the concept of 'national defense' for what is transparently a domestic effort to boost an uneconomic segment of industry would be an unprecedented abuse of the Act Using this statute to favor a particular industry that is struggling in the competitive markets would threaten that support and risk the loss of an important tool that could be needed to ensure national security," according to a statement from the Affordable Energy Coalition. And the conservative Heritage Foundation joined with the free-market think tank R Street Institute to decry the move. “The motives couldn't be more obvious — the same politically-tied companies that drove the last proposal are back at it again because they can't compete in the marketplace,” the groups wrote. This story was updated with comments from PJM.